House plants have become very popular. The key to picking the perfect addition to your home is to get a plant that is easy to care for and will thrive in most environments. No matter how easy they may be, they will still require regular maintenance. Water regularly and feed occasionally and they will last for years. 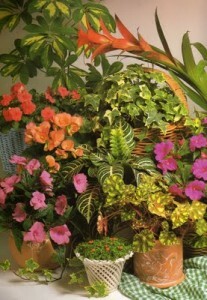 We also add fresh flowers to our dish gardens to give additional color!